Cluster of Galaxies - Solar System Planets And Moons Section. Cluster of thousands of Galaxies. Young star has grown up very quickly. Astronomers have found an embryonic star in a stellar nursery giving off a healthy glow of X-rays, even though it's much too young. The observations were mostly made using the European Space Agency's XMM-Newton observatory, and suggest that some unknown process is superheating the star's surface to generate X-rays. matter is falling towards the star 10 times faster than it should just with gravity, so it could be that the star's magnetic field is somehow responsible, channeling gas into the star. Young universe was surprisingly well structured. A team of European Astronomers have discovered a highly structured cluster of thousands of Galaxies at an incredible 9 billion light-years away. In other words, this structure was highly evolved only a few billion years after the Big Bang; a situation that should be impossible, according to current theories. Incredibly, some of the Galaxies in the cluster are red and elliptical, which would indicate that they were already quite old at only a few billion years old. 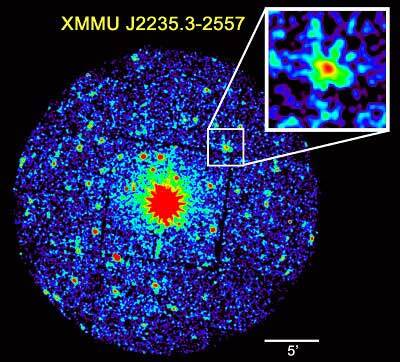 Spitzer space telescope finds hidden galaxies. How do you hide some of the brightest Galaxies in the Universe? Behind a shroud of dust, of course. NASA's Spitzer space telescope has uncovered a strange class of Galaxies which are incredibly bright - shining with the light of 10 trillion suns - but obscured behind a thick veil of dust and gas. So, why are they so dusty? The dust is churned out by stars, but it's strange how well distributed it is. It could be that all Galaxies started out this dusty, and then became clearer over time, or maybe the massive black hole at their center has something to do with it. Jupiter's auroras helped by Io. Jupiter's massive magnetic field is so powerful, it can generate auroras one thousand times more powerful than we'll see here on Earth. One of the best ways to study Jupiter's aurora is in the X-ray spectrum, watching how particles and ions crash into Jupiter's atmosphere. Observations from NASA's Chandra X-Ray Observatory suggest that these particles are partly coming from the Sun, but also from Io, Jupiter's volcanically active moon, which is known to be blasting out steady streams of particles.